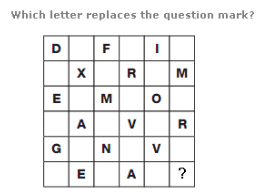 Missing Letters Puzzles - Can you spot what is missing? Working through the diagram in columns, left to right, the sum of the numerical values of the letters in each column follows the sequence 17, 18, 19 and 20. 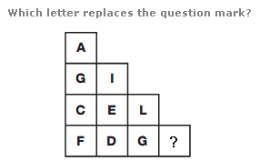 Read the diagram as a whole grid of 4x4 squares. 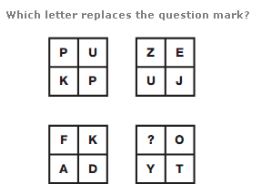 Starting on the bottom left square, move clockwise around the outside of the whole square, with letters written in sequence, skipping 4 letters at a time. Repeat this instruction for the small inner square. Start at the top left and move in alternate boxes from left to right, then down one row and to the left, in a snakes and ladders pattern. 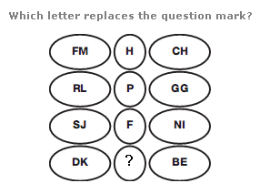 Letters advance through the alphabet in steps of 2, 3, 4...8, before repeating this pattern. In each row, the numerical value of the central letter equals the difference between the sum of the numerical values of the two left hand letters and the sum of the numerical values of the two right hand letters. Start on the far left of the diagram and move around it in a clockwise direction. 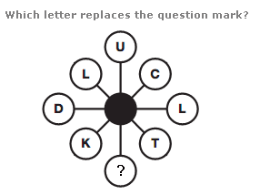 Letters advance through the alphabet in steps of 8 then 9, repeating this pattern all the way around.